The historical Orson Spencer Hall opened in 1955 and housed the largest college at the University of Utah: the College of Social and Behavioral Science. The high profile two-story building was the largest classroom building on campus at one time but needed to be redeveloped to fit the needs of 21st century learning and modern codes in the case of a seismic event. The new five-story building boasts the University of Utah Welcome Center, the Collaborative Social Science Advising Center, 33 classrooms, two auditoriums, a cutting-edge joint laboratory facilities, offices and study spaces. The John M. and Karen Huntsman Basketball Training Center combines remodeling of existing space and a new facility. The center will include a new gym floors with greater flexibility for practices and individual workouts. It will also include new offices, a weight room, training room, theater, player’s lounge and coaches’ lockers to provide greater accessibility to specific needs. This project will create a close proximity to all of the related needs of the program making basketball operations more efficient for the teams. Utah Valley University s one of the fastest-growing higher education institutions in Utah. The NUVI Basketball Center finally gives the Wolverines dedicated place to train with 8,000 SF courts and the Travis Hansen Strength & Conditioning Center, which is a 1,900 SF strength and condition space. The men's and women's coaches have 3,000 SF of office space on the second-floor and a mezzanine level that overlooks the courts. 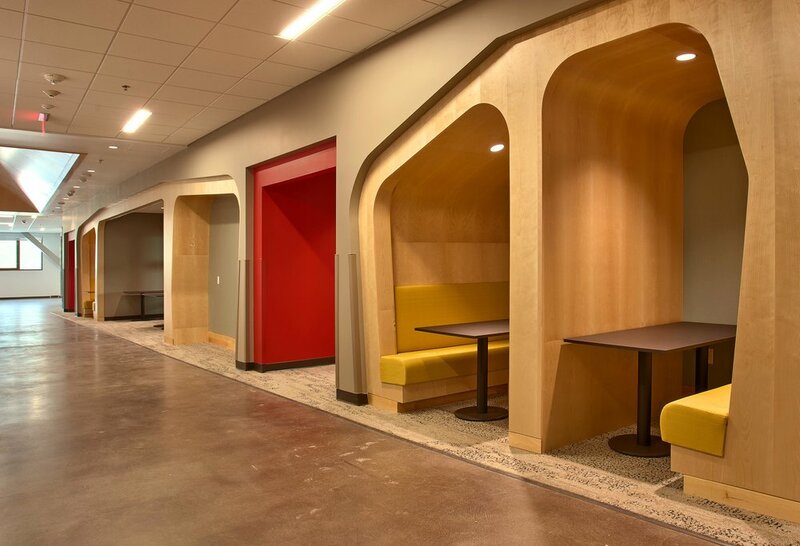 This university housing was designed to promote around a living and learning community model of Collegiate Success, Personal Development, Civic Engagement and Culture of Belonging. The urban mixed-use design boasts residential, dining and gathering spaces. Three five-story wings compromise 26 residential communities, providing 992 beds and two staff apartments. There is a 36,000 SF cafe and restaurant that seats 650 people and 24-hour community spaces—a multipurpose classroom, study areas and courtyard.